This will teach you how to view and change your settings. It will go through each setting and what each one will mean for your application. 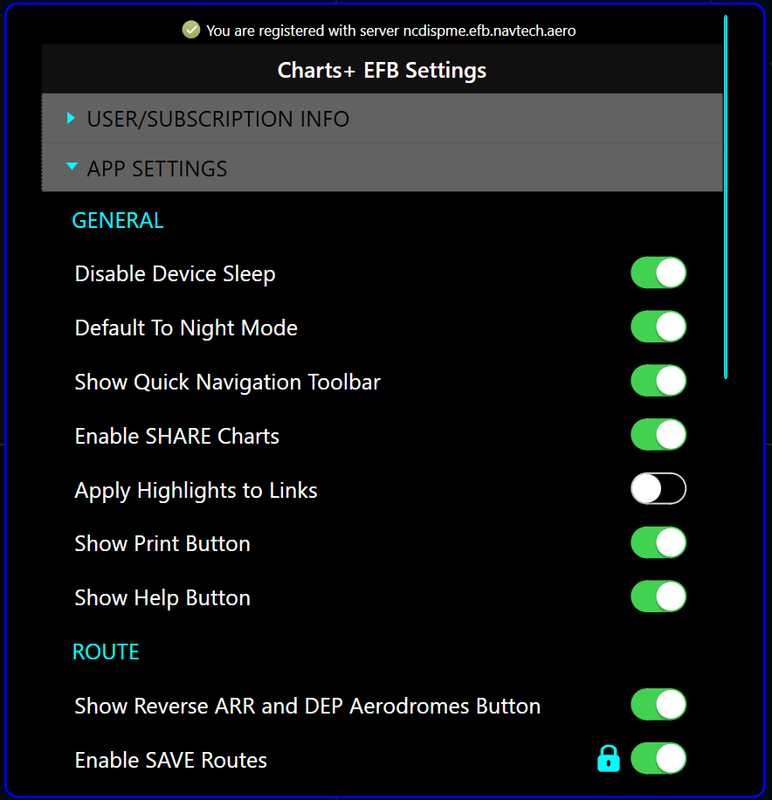 The Charts+ Windows setting are available from the Menu button from the Enroute screen. The settings are split into two sections. ■ The user subscription information. In this topic we will cover the applications settings only. You will be able to find the user subscription information in the Installation learning module. The application setting will allow you to change the way the application works. It will enable you to show and hide certain different types of settings by turning them on and off. 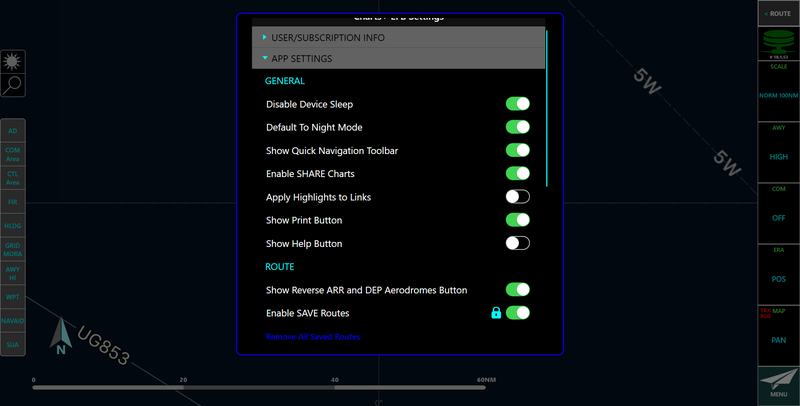 The settings menu with the two sections User/subscription info and App Settings. Let's go and look at the App Settings in more detail. To access the Settings start by going to the Menu. Settings are only accessed through the Menu button on the enroute screen. It cannot be accessed when looking in any other area, like aerodrome charts. Click the Show Help slider. The settings table is split into two sections. We will only talk about the "App Settings" in this topic. Each one of these have sub categories within them that you can turn on and off using the slider. Let's turn off the "Show Help Button". Help is located in the menu button. The Help button has now been removed and will not reappear until you have turned it back on. We can now go and turn it back on. The Help button has now reappeared. Let's have a look at each of the settings in more detail. Currently you are viewing the bottom half of the list, to view the top half you will need to either use your mouse scroll wheel or alternatively you can click and hold your left mouse button and move the mouse up or down to scroll. 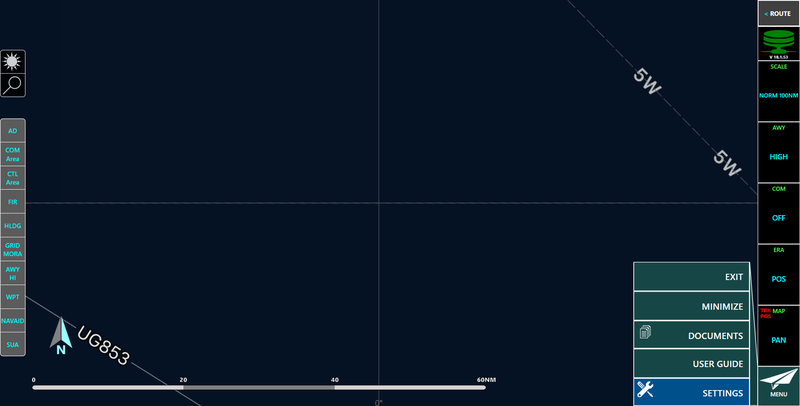 NAVBLUE Charts+ Windows application is on screen. This will override general windows settings. 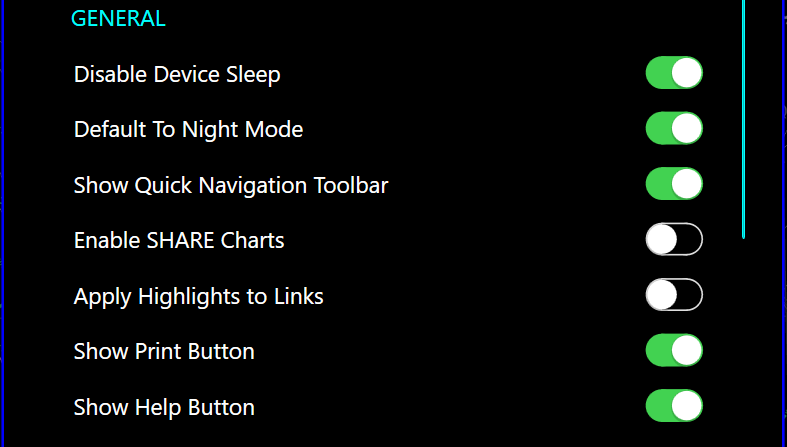 Default to Night Mode - NAVBLUE Charts+ Windows is automatically set to night mode. information on the Quick Navigation Toolbar. Enable SHARE Charts - selecting the “Share” button in the Charts Screen toolbar will send all selected charts of the current chart screen shown in the sending device to the receiving devices, including the zoom and panning state of the selected charts. Show Print Button - this will disable/enable the print button on charts or documents so you have the ability to print pages to a chosen printer. Show Help Button - this will disable/enable the help button in the menu. The help button will take you directly to the user guide. 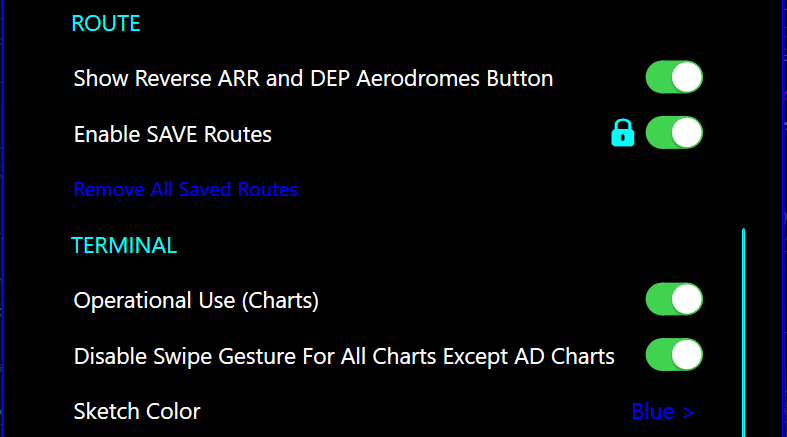 Show Reverse ARR and DEP aerodromes - show/hide the Reverse FROM/TO button. button is inactive until you have entered an aerodrome in both locations. route. This setting is controlled directly by your system administrator. Route = ON”. Tapping on the text will delete all saved routes. 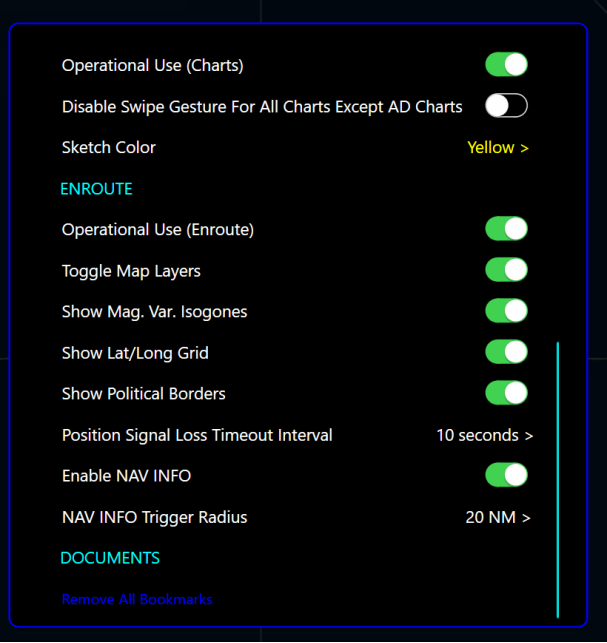 Disable Swipe Gesture For All Charts Except AD Charts - if the following setting is ON, swipe is impossible in all terminal charts excluding aerodrome charts and on all charts in Charts+ AD Charts in the document viewer. your charts. You will be able to select either green, blue, yellow or purple. Toolbar for more information on the Layer Toolbar. 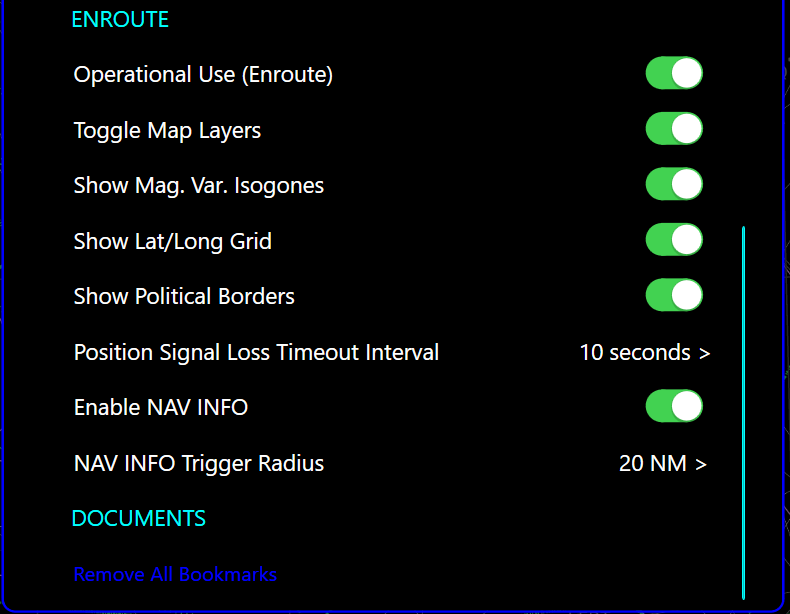 Show Political Borders - turn off/on Political Borders on the Enroute map. information based on a defined radius from your current position. 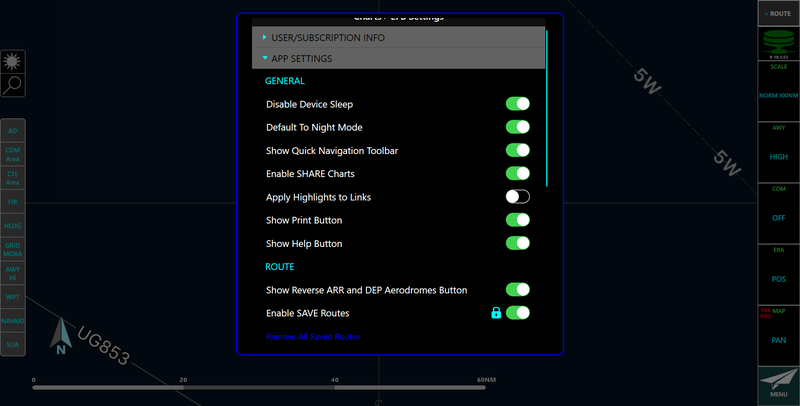 NAV INFO Trigger Radius – this setting allows you to define the radius from your current position when an important navigational information pop-up should be displayed. 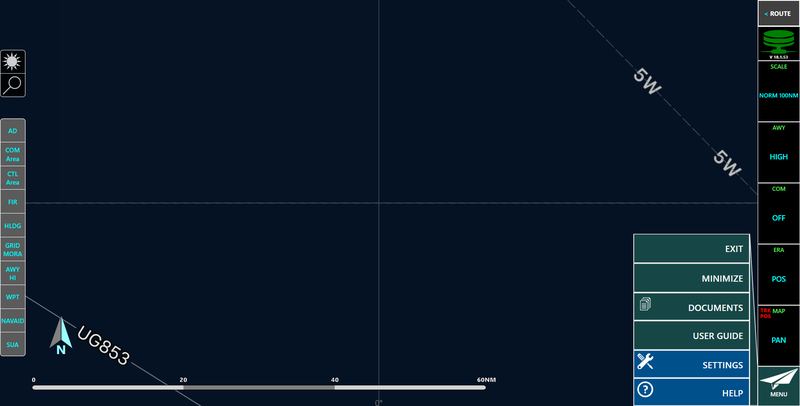 For instance, when you select 20NM, features on the Enroute map within 20 nautical miles of your current position a pop-up will automatically be displayed showing you important navigational information. documents from the document viewer.